Chinese hackers are mounting a dedicated campaign to try to steal accounts for the Guild Wars 2 video game. The ongoing attacks have led developer ArenaNet to start warning players when their account comes under attack. ArenaNet estimates that the attacks have caused problems with more than 11,000 accounts. It urged players to make their Guild Wars 2 login name and password unique to avoid falling victim. Launched less than two weeks ago, Guild Wars 2 lets players go adventuring in the mythical world of Tyria. 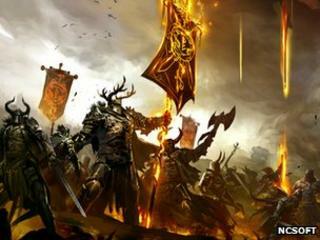 The massively multiplayer game is set 250 years after the original Guild Wars. Within days of the game being opened to the public, hackers started their campaign to steal accounts, reveal messages posted to the game's update pages by ArenaNet. The game developer said hackers were trying to get access to players' accounts using login name and passwords stolen from other places such as chat forums and fan websites. To avoid losing control of their account it urged players to use "a strong, unique password for Guild Wars 2 that you've never used anywhere else". ArenaNet said it had started contacting players when it saw that their account was being accessed from a new location or computer. Guild Wars 2 accounts are valuable because the virtual items and loot that players gather have a real world value. In addition, people who buy and sell virtual items covet stolen accounts as the more in-game characters they control the more cash they can generate. ArenaNet said almost 9,000 players had reported problems with getting access to the game, many of which were related to the ongoing attacks.